You can live for about three minutes without air, three days without water and about 21 days without food. But in between food and water, there is something else critically essential: sleep. It turns out you can only live about 11 days without sleep. You can give it a try if you don’t believe me, but, just like the other essentials, after day 11 you will probably die. Sleep is one of the most important things we overlook, because most of us don’t consider it vital. The problem isn’t you — it’s your brain. Brain scientists really don’t know what they are talking about when it comes to sleep. For far too long, we have known too little about why we sleep. Instead of acknowledging that fact, scientists have made up fairy tales to explain our need for sleep. They have guessed that sleep is necessary for creativity, rest, rejuvenation and recovery. A study of a remote tribe wearing actigraphs suggests for the first time that a 50-year-old theory on animal sleep patterns applies to humans. There are hints of truth to all of those explanations, but they don’t give us the whole picture. It must be far more important to our survival given how dangerous it is to be asleep. Before we evolved into social animals with a knack for creating shelters, humans were at huge risk in the wild. Falling unconscious is the last thing a sapient Homo sapien would do to survive, unless sleep is really, really important. There are safer ways to rest than unconsciousness. And Picasso aside, creativity just isn’t a primal survival tool. So why sleep? Until now, my answer has always been don’t, or at least do the minimal amount needed to function. But new science has finally given us an answer to the mystery of sleep. In 2013, Danish scientists testing mice found that as animals sleep, their brains actually compress and grow smaller. Roughly 75% of our brain mass is water weight in the form of blood. Our brains receive energy from blood, so when the blood is pumping, our brains are plump. As we sleep, various parts of our brain shut down, and that reduced power consumption reduces the swelling across our neurons. The brain’s blood retreats, creating large empty spaces. It is what happens next in the brain that makes sleep so vital to our survival. Our bodies leverage something called the lymphatic system to push out toxins. The lymphatic system mimics the flow of blood throughout our entire body and works to remove waste and byproducts as we consume energy. Blood is filled with nasty toxins, but our bodies take the good, and the lymphatic system excretes the bad. The lymphatic system works throughout the entire body with one exception: the brain. The real estate in our heads is incredibly expensive. This leaves the brain so tightly packed that the skull can’t accommodate a complex structure such as a lymphatic system. For years, scientists were convinced the brain was a tremendous recycler of waste: Rather than dispose of waste through the lymphatic system like the rest of our bodies, it was thought that we mysteriously reused byproducts, as if the brain subscribed to composting. In hindsight, it was a pretty stupid assumption. Recycling is expensive in terms of both energy and space, so there is no good reason why we would have evolved to expend effort to reuse junk when the good stuff was so abundant. But alas, scientists make educated guesses when we can’t figure something out, and where all that waste went was a huge mystery. Enter Danish scientists and their discovery about the brain shrinking when we sleep. As it happens, our cerebrospinal fluid — the stuff scientists thought was there solely to protect our brains from hitting our skulls — actually flows into and throughout the brain when we sleep to fill the void from the missing blood. As we cycle through five sleep stages roughly every 90 minutes, the cerebral fluid flows in and out, gently cleaning our brains of toxins. This is evolution at its finest: The brain takes aim at two birds, using the cerebral fluid both for protection and for cleaning. It is the same concept used in our mouths, another area where the lymphatic system can’t reach because it falls outside the blood system. The enzymes in saliva act as mouthwash, constantly cleansing our teeth, tongue and gums. We imitate this process when we floss. When it comes to the brain, we have no artificial way to replicate nature. That’s where sleep comes in, by reducing the brain’s size to make room for the mental mouthwash. The process of sleep very elegantly acts as a cleansing agent to remove the brain’s toxins. Becoming a morning person is easier than you think and there are a ton of benefits to waking up early. Without any sleep, toxins build up and kill us after about 200 hours. In the case of limited sleep, these toxins kill us over time. Lack of sleep is linked to far too many issues to fully list, including chronic fatigue, confusion, poor decision-making, irritability, headaches, weight gain, depression and heart disease. Sleep deprivation has also been linked to Alzheimer’s, Parkinson’s and other long-term degenerative brain diseases. Given we are talking about constipation of the brain, the negatives should come as no surprise. The short-term issues are also pretty severe but again, largely misunderstood. People say they feel drunk or drugged when sleep deprived. Hogwash. You don’t “feel” drugged; without sleep you ARE drugged. The brain is the single-best producer of mind-altering drugs. Artificial drugs are just an awkward human attempt to recreate what the brain does naturally. Pick your poison — cigarettes, caffeine, heroin, cocaine or even chocolate. All of these merely replicate what we already produce in our brains. The brain produces these drugs constantly, so if we don’t purge ourselves from the resulting toxins, we remain drugged. Sleep is the only known cure. Without it, your mind is being overloaded like a drug addict clinging to their next fix. Doctors are in agreement on the precise level of sleep needed — at least seven hours is necessary per night. Not five or six hours because you think you can handle it. That may be OK in the short term, but shortsighted thinking will kill you eventually. Sleep deprivation compounds, so every night counts. None of us are immune, no matter how busy or important you are. So the next time you start thinking about how to better yourself, improve productivity or stay ahead of the herd, lose the bravado and just go to bed. Jeff Stibel is vice chairman of Dun & Bradstreet, a partner of Bryant Stibel and an entrepreneur who also happens to be a brain scientist. He is the USA TODAY bestselling author of “Breakpoint” and “Wired for Thought.” Follow him on Twitter at @stibel. A tired brain reduces our reaction time and danger identification accuracy. Are you feeling tired? You are not alone; more than a third of New Zealanders report either not getting enough sleep, or that the quality of their sleep is compromised. It’s well known that sleep deprivation has negative effects on attention, mood, memory, reaction time and decision-making, but just how dangerous could being overtired be? New research out this week in the journal Nature Communications tried to put some measurements on tired brains and the results show tiredness could have some serious consequences. The study took 12 patients, who were scheduled to have surgery to help with their epilepsy. The patients had electrodes implanted in their brains and were kept awake overnight. During the night, they were asked to carry out a simple cognitive exercise which involved looking at pictures and then quickly pressing one of two buttons to identify if the picture was of a human face or not. As the patients became sleepier, they were less accurate at correctly identifying the pictures and their response times were slower. To try and work out why the sleepy patients were performing poorly, the researchers used implanted electrons to measure signals from individual neurons in their brains during the test. They found that in the tired patients, their neurons responded more slowly, fired signals more weakly and transmitted for longer compared with the brain cells from well-rested brains. They also found evidence that suggested parts of the tired brain were trying to take localised naps, with areas firing more slowly and showing sleep-like slow brainwaves. This regional brain napping has been seen before in sleep-deprived rats whose brains also seemed to show localized slow brain cell firing and a reduced ability to perform cognitive tasks. Knowing that tired brains reduce our reaction time and danger identification accuracy, as well as make us perceive and react to the world more slowly, opens up questions around the potential dangers of driving or using machinery while tired. We already know that the performance of the brain declines with alcohol consumption, and these new results show that tiredness while driving could be just as deadly. If it takes your tired neurons more time to respond to a simple photo identification game, imagine the consequences of a slower reaction response if a pedestrian walked out in front of your car. Sadly, unlike a breath-alcohol test, there is no easy test to externally measure how tired a person’s brain is, so the responsibility lies on the individual to make good decisions about their mental clarity before driving. There is no set number for the amount of quality sleep we need to function properly. Studies suggest it hovers around eight hours for most of us, with some needing more and some needing less. The general rule is that if you wake up tired and spend the day longing for a nap then you are probably not getting enough sleep. Wearable technologies such as smart watches can help us to monitor our sleep cycles and track them against our mood to determine individual preferences. Unlike eating and breathing, we still don’t fully understand why people need to sleep, but we do know that sleep is essential and getting enough sleep is important for your health. Some theories link sleep to the time our brain needs to store its memories from the day, others link sleep to hormone regulation. Whatever it is, sleep deprivation has been linked to weight gain, inflammation, diabetes and heart disease. Life is busy, and getting enough sleep is tough, but prioritising sleep could actually help you to live longer, healthier and less grumpy lives. Flame retardant chemicals have been linked to serious health risks, including infertility, birth defects, neurodevelopmental delays, reduced IQ, hormonal disruptions and cancer. In fact, flame retardant chemicals have been identified as one of 17 “high priority” chemical groups that should be avoided to reduce breast cancer.4,5 These chemicals are also poisoning pets6 and wildlife. The most comprehensive recommendation is to opt for organic or “green” alternatives no matter what product is under consideration — be it a piece of furniture, clothing, kid’s toy or yoga mat. This is by far the easiest route, as manufacturers are not required to disclose the chemicals they use to make their products comply with fire safety regulations. Items made with wool, organic cotton or silk are excellent alternatives to conventional mattresses, bedding and exercise pads as these materials are naturally flame-retardant. According to recent research, more than 80 percent of women struggling with infertility had three types of organophosphate flame retardants (PFRs) in their urine.7,8,9,10 Women with high levels of these chemicals were also about 40 percent less likely to conceive after a full cycle of in vitro fertilization (IVF) treatments, compared to those with the lowest levels. Previous research has linked PFRs to infertility as well, showing the chemicals interfere with reproductive hormones. While the featured study focused on women, other studies12 have linked PFR exposure to lowered sperm motility in men. PFRs are commonly added to polyurethane foam, gym mats and baby items such as car seats, ostensibly to reduce the risk of the items catching fire. However, the chemicals do not remain in these items. They spread, contaminating air and dust. They can also migrate through direct contact. One 2015 study13 found nearly every dust sample collected from American homes contained the flame retardants Tris phosphate and triphenyl phosphate (TPHP). Ninety-one percent of urine samples from the residents also contained metabolites of Tris phosphate, and 83 percent had metabolites of TPHP. Disturbingly, toddlers have been found to have levels of flame retardants that are as much as five times higher than their mother’s.14 Needless to say, bioaccumulation can have serious health consequences over the course of a lifetime, and may ultimately affect the reproductive capacity of coming generations. Despite industry claims that these chemicals are necessary and save lives, there’s virtually no evidence to suggest they actually work as advertised. On the contrary, mounting evidence shows they only make house fires more dangerous and deadly — especially for firefighters who are repeatedly exposed to these toxic fumes.15 For example, California female firefighters aged 40 to 50 are six times more likely to develop breast cancer than the national average. According to the chemical industry, fire-retardant furniture increases your escape time fifteenfold in the case of a fire. This claim came from a study using powerful, NASA-style flame retardants, which provided an extra 15 seconds of escape time. But this is not the same type of chemical used in most furniture. Tests have shown the most widely used flame retardants provide no meaningful increase in escape time at all, while actually increasing the toxicity of the smoke. Ironically, these toxins are far more likely to kill you than the fire itself. The primary industry front group responsible for perpetuating the myth that flame retardant chemicals save lives was Citizens for Fire Safety, founded in 2007. The group was disbanded in late 2012.16 While sounding like a grassroots organization of concerned citizens and fire professionals, it was actually a trade association for the three largest manufacturers of flame retardant chemicals in the world. The aim of this group was to protect the chemical industry from legislation that might cut into their business, and expanding the commercial use of flame retardants. For example, when California tried to ban flame retardants in 2007, Citizens for Fire Safety spent $22 million to defeat the measure. Over a five-year period, the group successfully defeated nearly 60 bills throughout the U.S. trying to rid flame retardants from the market.17 The American Chemistry Council (ACC) maintained it had nothing to do with Citizens for Fire Safety. However, Grant David Gillham, former head of Citizens for Fire Safety, has admitted the ACC “flat out lied” when they denied working with his group. According to Gillham, an ACC executive instructed him to make sure their association remained secret.18 Citizens for Fire Safety was caught in a public scandal when it was revealed they paid $240,000 to former Seattle burn surgeon David Heimbach, who gave heart-wrenching but false testimony about babies being killed in fires because flame retardants weren’t used. The infants Heimbach identified turned out to be fictional and, in 2014, Heimbach surrendered his medical license as a direct result of the fallout from what he did. The HBO documentary, “Toxic Hot Seat” is well worth watching if you want to learn the truth about flame retardants and the history behind them. Embedding of this video is not allowed due to copyright claims, but you can usually find working links to it on YouTube. “[R]ats exposed to polybrominated diphenyl ethers, or PBDEs, experienced a disruption in their metabolism that resulted in the development of metabolic obesity and enlarged livers. ‘Despite the plethora of resources devoted to understanding the roles of diet and exercise in the obesity epidemic, this epidemic continues to escalate, suggesting that other environmental factors may be involved. Another study22 evaluating the effects of the flame retardants tetrabromobisphenol A and tetrachlorobisphenol A — both of which are commonly used in electronic devices — came to similar findings. Here, zebra fish that were exposed to relatively low levels of the flame retardant chemicals grew longer and heavier than their unexposed siblings in the control group. In June this year, CPSC staff produced a 537-page briefing paper on the matter, concluding there was “insufficient evidence” to support the petitioners’ claims.30 As a result, they recommend the Commission reject the petition “for lack of evidence.” A public hearing date, at which time interested parties can present oral comments, has been set for September 14, 2017 at 10 a.m. in Bethesda, Maryland.31 Time will tell whether organohalogen flame retardants will be banned or not, but as of right now it doesn’t look too promising. The sad fact is, you’re more or less on your own when it comes to protecting yourself and your family from toxic chemicals. Just because a chemical is permitted to be used does not mean it’s safe to do so. A staggering 80,000 chemicals are used in household goods and furnishings, and few of them have been tested for safety. • Identify and replace hazardous furniture. Polyurethane foam products manufactured prior to 2005, including sofas, chairs, mattresses and pillows are likely to contain PBDEs. Carefully inspect such items and replace ripped covers and/or any foam that appears to be breaking down. Avoid reupholstering furniture by yourself, however, as the reupholstering process increases your risk of exposure. Pay attention to “wrinkle-free” claims, as this usually means they’ve been treated with risky perfluorinated chemicals (PFCs). Chemicals added to bedding to increase softness and/or help prevent shrinkage may also emit formaldehyde gas. If in doubt, you can have a sample of your polyurethane foam cushions tested for free by scientists at Duke University’s Superfund Research Center. This is particularly useful for items you already have around your home, as it will help you determine which harmful products need replacing. • Take precautions when removing old carpeting. Older carpet padding is another major source of PBDEs, so take precautions when removing old carpet. You’ll want to isolate your work area from the rest of your house to avoid spreading it around, and use a HEPA filter vacuum to clean up. • Wash your hands after handling fireproofed items produced before 2013. You may have older sources of the PBDEs known as Deca in your home as well. These are so toxic they’ve been banned in several states, including Vermont, Washington, Oregon and Maine. In 2009, the two U.S. makers of DecaPBDE voluntarily agreed to stop producing and importing the chemical for all uses by 2013.32 However, many items made before then would contain it. DecaPBDE can be found in electronics like TV and cellphone casings, kitchen appliances, fans, toner cartridges and more. It’s a good idea to wash your hands after handling such items, especially before eating, and at the very least be sure you don’t let infants mouth any of these items (like your TV remote control or cellphone). • Keep your home dust-free. Flame retardant chemicals are often found in household dust, so clean up with a HEPA-filter vacuum and/or a wet mop often. • Select safer replacement products. As you replace items containing flame retardants, look for items that clearly state they’re “flame retardant free” or select those that contain naturally less flammable materials, such as leather, wool and cotton. This is particularly important for items you sit or sleep on for many hours each day. I recommend looking for a mattress made of either 100 percent organic wool, which is naturally flame-resistant, 100 percent organic cotton or flannel, or Kevlar fibers (Stearns and Foster is one brand that sells this type of mattress). There are a number of good options on the market. A simple alternative to your rubber yoga mat is a cotton rug, runner or woven yoga mat. You spend approximately one third of your life in bed. With that in mind, it’s a good idea to invest in a mattress that will promote good health and comfort rather than going for the one that has the lowest possible price tag. Before you dive in and decide whether now is the right time to get rid of your existing mattress in favor of a longer lasting mattress, consider a few of these factors first. How Long Have You Owned Your Mattress? Depending on the type of mattress you have, the age of your mattress can play a critical role in its overall usefulness. For instance, not only do innerspring mattresses lose a fair amount of their supportive structure over the years, but they also harbor potentially harmful things like dust mites, dead skin cells, mold, mildew and more. Don’t believe it’s true? Try to lift your existing mattress and compare it to a new innerspring mattress from a store. You’ll probably notice that the new mattress weighs considerably less. The average innerspring mattress has a lifespan of only five to seven years. 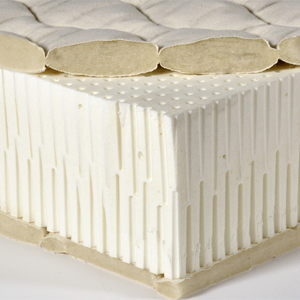 When you compare that to a natural latex mattress that has a lifespan of up to 25 years, you can see there is a significant difference from the start. More importantly, latex mattresses maintain their shape and elasticity, thanks to the foam rubber foundation of latex foam, without breaking down over time the way other mattresses tend to do. How Safe Do You Want Your Mattress to Be? People everywhere are beginning to take notice of the toxins and chemicals you expose your families too. If you’ve done much research on the matter at all, you know by now that there are chemicals lurking at every turn. Sadly, this includes chemicals buried inside common household items like sofas, wood furniture, and even your mattress. These chemicals can include a wide variety of ugly things that can transform something as innocent as a mattress into a toxic cesspool of germs, odors, and health risks for the entire family. Chemical flame retardants, for instance, that are commonly used in mattresses and pillows, are notorious for carrying harmful toxins that your inhale into your body while you’re sleeping. Among the negative health impacts this can have are upper respiratory problems, liver damage, infertility, loss of energy, and so much more. These things aren’t present in natural latex mattresses that not only do not have VOCs (volatile organic compounds), but also lack adhesives, which often contain formaldehyde and other toxic ingredients, too. The fewer toxins you bring into your home, the less you have to worry about exposing your family to harm through environmental toxins in your household. There is an unintended benefit to this in that you also don’t have to worry about off-gassing with natural latex mattresses. Off gassing occurs when petrochemicals mix with air, usually when you remove traditional innerspring mattresses from their packaging. What it is, is a harmful, chemical odor that can cause headaches and breathing difficulties for some individuals – in addition to a truly foul smell. You will pay more up front for your natural latex mattress. This is especially the case if you invest in a quality mattress. The upsides, though, make this a mattress that is even more affordable than you may realize at first glance. These are a few of the benefits to consider. 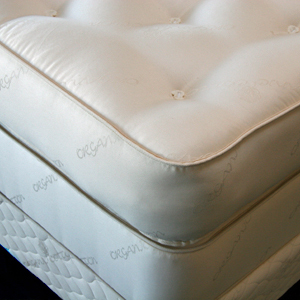 Natural latex is naturally resistant to many common problems for mattresses including microbes, mildew, bacteria, dust mites, bed bugs, and mold. Just imagine the benefits of not exposing yourself or your family to these things night after night while you sleep! No chemical fire retardants. The toxins contained in most fire retardants are well-documented and include everything from behavior problems in children to serious health risks. Natural latex mattresses use natural fire-retardants, like wool, for this critical safety feature. Natural latex mattresses are earth-friendly in many ways. Among them is the fact that natural latex mattresses are 100 percent recyclable, they contain no VOCs, and they last up to 25 years, meaning that even that they don’t have to be replaced (or disposed of, nearly as often). Can you imagine how much landfill space is occupied by innerspring mattresses that aren’t recyclable, but must be replaced every five to seven years? This alone makes natural latex infinitely friendlier when it comes to the planet. Yet another planet-friendly feature is the fact that they are manufactured in a planet-friendly manner as well. The planet wins, your family wins, and you can sleep easy without fears of hurting the earth in the process. Aside from the environmental factors and various toxins innerspring mattresses bring into your home there is there body factor to keep in mind. Natural latex is made of latex foam that offers an incredible amount of support and durability. Unlike memory foam, your body doesn’t sink into the mattress leaving you feeling as though you’re being swallowed whole by your mattress. It’s different from innerspring mattresses in that it maintains the same level of comfort and support for the entire life of the mattress without sagging, lumping, and bumping along the way. This means more support for your back if you’re a back or stomach sleeper because there is no sagging and no loss of comfort for your pressure points if you’re a side sleeper (especially if you choose a latex mattress with a Dunlop core and Talalay comfort layer). One more huge body benefit for natural latex is the coolness factor. The open-cell nature of natural latex foam allows cool air to flow to your body throughout the night, so you can fall asleep faster and stay asleep longer for healthier, happier mornings for the long life of your latex mattress. The long and short answer as to whether now is the time to ditch your toxic old mattress for the many benefits natural latex has to offer is a resounding “Yes!” It’s a decision you’re going to be glad you made for the sake of your health, the health of your family, and the planet. The new release sheds light on long-held notions about getting some shut-eye. The truth about sleep myths such as ‘I should have 8 hours’ sleep’ are revealed in a new book by leading sleep scientists including Professor Graham Law from the University of Lincoln. The release debunks 40 popular and persistent beliefs on how to get a good night’s sleep. Sleep Better: The science and the myths by Professor Graham Law and Dr Shane Pascoe examines in detail common misconceptions such as ‘The older I get, the more sleep I need’ and ‘Cheese gives you nightmares’. Professor Graham Law is a sleep scientist with more than 25 years’ research experience. Based in the School of Health and Social Care at the University of Lincoln he is an Honorary Secretary of the British Sleep Society and specialist in health and epidemiology. Dr Shane Pascoe is a psychologist at the University of New South Wales, Australia, with 20 years’ experience helping people with a variety of sleep disorders. Professor Law said: There is a lot of mythology around getting a good night’s sleep, much of it well-intentioned, yet some of the most persistent myths are not only flawed, they could actually be harmful to our health and well-being. The book explains how sleep is governed by two processes: each person has their own ‘sleep debt’ and circadian rhythms – physical, mental and behavioural changes that approximately follow 24-hour cycle, responding primarily to light and darkness. In healthy people these two processes should work in tandem but they can also run out of synch, and these imbalances are often the cause of sleep disorders. Common problems include insomnia, sleep apnea or excessive snoring. The book outlines the scientific evidence relevant to each myth. Each chapter closes with ‘top tips’ for readers to address underlying issues behind common sleep problems, for instance, the value of maintaining a sleep diary to understand individual sleep needs rather than aiming rigidly for a “staple” eight hours in bed each night. Practical advice is based on principles of CBTI (Cognitive Behavioural Therapy for Insomnia), which aims to address the causes of sleep problems by adjusting individual attitudes and behaviours rather than through medication. Sleep Better: The science and the myths is available in paperback, £9.99, and ebook by Sheldon Press. Mattress shopping can be one of the most agonizing experiences, from pushy salespeople to an overwhelming number of options to not actually knowing what you need in the first place. It’s so easy to end up with the wrong one, but it doesn’t have to be that way. The Huffington Post spoke with Jay Orders, the co-owner of Christeli, to get a better understanding of what we really need to look for when we hit that showroom floor. His family has been in the mattress-manufacturing business since 1931, and he’s worked in almost every part of that process in a factory setting to be able to separate the hard product truths from the marketing myths. Ready to look past all the gimmicks? Here are seven myths you’ve probably heard at some point in your mattress shopping endeavors that couldn’t be further from the truth. Myth #1: You must, must, MUST get a pillow-top mattress because they make the most comfy beds EVER. This is a common misconception created by different companies looking to distinguish their products from their competitors. But Orders claims that the same plush feel can be achieved with a traditional mattress design, despite how boring that may sound. It’s more so about the structural integrity of the mattress. And if you want to create a fluffy princess bed, there’s nothing wrong with topping off a solid, standard mattress with a cushioned pad of your choice. Myth #2: No biggie — one size fits all. Try again. Why would one mattress feel the same, offer identical support and last the same amount of time for a 120-pound woman and a 250-pound man? Simple answer: It wouldn’t. It seems to be a growing trend among new mattress companies to try and cut out the complicated distinctions that come along with a catalog of different models, and make the case that all mattresses are essentially the same. But it’s still important to factor in things such as a person’s natural sleeping position, any sleeping difficulties or disorders, their age and weight, and general preferences from previous mattress experiences, according to Orders. Myth #3: You’re most definitely going to get the total value (and then some) of that lifetime warranty. The National Sleep Foundation recommends changing your mattress every seven to 10 years, regardless of any outstanding warranty. That’s the most important detail to keep in mind. How long your mattress will last depends on several factors like usage and its original quality, but generally speaking, it’s gotta go after that 10 year mark. It won’t provide you much support and comfort after that. Unless your bed frame still uses slats for support, you do not need a box spring, according to Orders. Box springs were first invented to help absorb shock since mattresses themselves were so much thinner back then. Nowadays, all box springs really do is just raise the profile of your bed. So again, if you’re going for the princess look, start stacking. Otherwise, it’s just an additional, unnecessary cost. All you need is a solid platform underneath your mattress for support. Myth #5: Giving your mattress a test lie-down on the showroom floor is enough. This fact is key when it comes to shopping with a mattress company that offers both a reasonable trial period and return shipping rates in case the one you choose initially ends up not being the perfect fit. Some companies don’t offer trials at all, and others’ return pricing can get pretty steep. Either way, don’t just sneak in a catnap in the store and call it a day here. Myth #6: There’s a reason these people are selling mattresses: They’re SLEEP GENIUSES. Sorry folks, it doesn’t take much sleep expertise to work as a mattress salesperson. And just like many others in the trade, they work on commission, says Orders, which is why in many retailers, they tend to push the higher priced options the hardest. When it comes to gaining the best mattress insight, Orders recommends finding someone you really trust and discussing your needs and concerns candidly with them. Product reviews online can also be a great source of information that are worth a read. Keep your eye out less for brand names and more for quality materials, because that’s what’s ultimately going to help you sleep well at night. Myth #7: If you have a bad back, you’ll regret not buying a hard, firm mattress. Sleeping on a mattress that is too firm creates aches and pains on pressure points rather than catering to that curvature, leading to a night full of tossing and turning. It’s important to pick one that supports your head, shoulders, hips and feet all in proper alignment. Those who struggle with back issues need to pay particular attention when shopping to find the fit that’s both supportive and comforting in all the right places. By Alena Hall for the Huffington Post. Doctors say processed foods can disrupt sleep even cause chronic disease. “Processed foods are higher in the glycemic index. They can lead to cancer, heart disease, gestational diabetes, beyond just obesity itself; there are a lot of things that it leads to,” said Dr. Colon. Doctors say a lot of chronic diseases and sleep disorders could be prevented if patients altered their diet and lifestyle. Instead of eating processed foods and sugary snacks, go for more nutritious meals with fruits and vegetables and lean protein. “If you’re eating 90 calories from a bowl of strawberries, you at least have phytonutrients, antioxidants, to buffer some of the high sugar stress. But if you’re getting 90 calories from a pack of gushers there are no antioxidants in that and that just causes a burden of stress there,” said Dr. Colon. Throughout the day, he recommends patients eat more good fats like nuts, seeds, avocado, and avoid the bad fats like oil and anything fried. “Life has a rhythm and we have these biological rhythms in sleep and in digestion as well. Some of the burden that chronic disease has, we end with medications that end up interfering with our sleep, and then we end up gaining weight, and then we have sleep apnea,” said Dr. Colon. Maintaining a healthy and nutritious diet can keep your weight and sleep normal. When you buy organic, you’re buying into a type of agriculture with many benefits. Here’s the scoop on Soil Health. In response to the May 28 article “Your organic cotton t-shirt might be worse for the environment than regular cotton”: Quartz’s article fails to consider the big picture when comparing the environmental footprint of organically and conventionally grown cotton. Conventional cotton yield has increased over the past three decades, but these yield gains have come at a high cost. For instance, cotton is notorious for being one of the world’s most chemically intensive crops. The article briefly notes that conventional cotton production utilizes the herbicide, glyphosate, which has been categorized as a “probable carcinogen” by the World Health Organization. But it fails to recognize the growing use of chemicals in conventional cotton production that are demonstrably more hazardous than glyphosate in response to the emergence of glyphosate resistant “super weeds”. For example, the EPA recently approved new cotton varieties, Xtend and Enlist, which are each resistant to three herbicides: glyphosate, glufosinate and dicamba, and glyphosate, glufosinate and 2,4-D respectively. These new GMO varieties are expected to replace the traditional Round-Up ready cotton and are anticipated to increase the amounts of these chemicals used in conventional cotton production. Increased use of dicamba and 2,4-D are of particular concern since they are potentially more toxic than glyphosate and significantly more susceptible to drift, increasing the risk of contamination to nearby crops as well as human exposure. In addition to water contamination and negative impacts on wildlife, studies have linked exposure to 2,4-D with neurological disorders, and immune system suppression in humans. The article also does not adequately take into account differences in energy consumption between organically and conventionally managed cotton systems. It claims that reduced organic yields are linked to higher greenhouse gas emissions, but it needs to be pointed out to readers that this conclusion is drawn from statements by a sociology researcher whose study has been criticized by the scientific community for drawing far reaching conclusions based on inadequate data. A closer look at the existing science reveals that organic cotton outperforms conventional cotton when it comes to climate change mitigation. A life cycle analysis for organic cotton found that energy demand, calculated on a per yield basis, was 62% lower than that of conventional cotton and that the total global warming potential of organic cotton was 46% lower than that of conventional cotton. These results are consistent with other studies that have found that organic production methods significantly reduce GHG emissions and use less energy. June 19, 2017 — Peek into the typical American household after dinner and you’ll find the occupants bathed in a faint bluish glow. As parents fire off late emails on their laptops or lie in bed with eyes fixed on e-readers, kids update their Snapchat accounts or squeeze in one last game on their phones. Even if the gadgets are off, new eco-friendly street lamps, TVs, and household bulbs shine into the night, emitting a brighter, shorter-wavelength (more bluish), and more potent light than older incandescent bulbs did. All that concerns Charles Czeisler, PhD, MD, chief of the Division of Sleep and Circadian Disorders at Brigham and Women’s Hospital in Boston. Czeisler is among a growing number of physicians, researchers, and health policy makers sounding the alarm that dark nights — like a healthy diet, regular exercise, and good sleep habits — are a key, endangered ingredient for long-term health. Much of the research so far has been done on animals or comes from large population studies, which show patterns but don’t confirm cause and effect. But many health experts say the results are troublesome enough to warrant action now. “As opposed to the many other kinds of harmful environmental pollutants out there, we are rapidly figuring out exactly what to do about this one, and it is really not that hard,” says Richard Stevens, PhD, a University of Connecticut cancer epidemiologist and light-at-night researcher. Just dim the lights at night and tone down that blue, he says. Light is by far the most important synchronizer of human circadian rhythms, or body clocks, Czeisler says. Specialized cells in the retina are finely tuned to respond to the short-wavelength light that comes from a cloudless blue sky. As light rays hit those cells, they tell the brain to stop pumping out drowsiness-inducing melatonin and start making hormones like cortisol and ghrelin that wake us up and make us hungry. At dusk, in an electricity-free world, the opposite happens. As light fades, the body begins to transition to “nighttime physiology,” in which melatonin levels rise, body temperature drops, sleepiness grows, and hunger goes away. The time spent in this restful state, even if we are not actually sleeping, is restorative, Stevens says. Trouble is, in the modern world, we are bathed by lights that have the same potent wavelength that wakes up to, so our transition to nighttime physiology has been delayed by hours. The best-documented consequence, by far, of excess evening light exposure is short-term sleep disruption. In one study, people in a sleep lab who read from an e-reader at night saw their nighttime melatonin levels drop by 55% after 5 days, took longer to fall asleep, had less restorative rapid eye movement (REM) sleep, and felt more groggy the next day than those reading a paper book. It’s the caffeine. But you knew that when you ordered it, didn’t you? It was perfect with that apple pie — but at 3 a.m., when you’re still awake? Not so much. Caffeine lurks in lots of places: tea, chocolate, soft drinks, and energy drinks. Another study, looking at teenagers, suggests they may be even more sensitive to light at night. Just an hour of exposure from a glowing device, like a phone, suppressed melatonin by 23%; 2 hours decreased it by 38%. Sleep issues aside, light at night is now being accused of helping fuel weight gain and metabolic diseases. Studies show that people exposed to more bright light at night are hungrier and produce less insulin, making it harder for them to turn those late-night snacks into fuel. As a result, it rests in the blood, where it makes diabetes more likely, or it’s stored as fat. One March 2016 study by University of Haifa researchers compared World Health Organization obesity data with military satellite images of nighttime lighting and found that the men and women who lived in the places most illuminated at night were also the most likely to be obese. Animal studies at Ohio State University show that even exposure to relatively dim light — about the brightness of a child’s nightlight 3 feet from the eyes — over 8 weeks has a measurable impact on the brain. It raises inflammation and lowers levels of a hormone that’s key for promoting new brain cell growth. It also causes transmitters between neurons to whither. Research is young, but some studies suggest that chronic exposure to excess light at night may also fuel cancer, in part by lowering the levels of melatonin — a known anti-cancer agent — circulating in the blood. Female night shift workers have a 50% to 70% greater chance of developing breast cancer during their lifetime, says David Blask, MD, associate director of the Tulane University Center for Circadian Biology. One recent study of 75,000 nurses, published in the American Journal of Preventive Medicine, found that those who worked the night shift for more than 5 years were 11% more likely to die early. Some European governments, with health risks in mind, now pay women night shift workers hazard pay. “In a sense, with all our gadgets, we are all night shift workers to a degree now,” says Blask. Mariana Figueiro, PhD, light and health program director at the Lighting Research Center in Troy, NY, stresses that in addition to minimizing bright blue-hued light — especially from gadgets held close to the eyes — at night, we should try to maximize the amount of bright light we get during the day. “It not only makes you more awake and alert by day; research suggests it may also make you less sensitive to the negative health consequences of light at night,” she says. Stevens says that beyond the 7 to 8 hours of sleep you try to get each night, you should make an effort to get 3 more hours of relative darkness. You don’t need to live by candlelight after dinner, but it’s a good idea to dim the lights and steer clear of bright blue screens. Replace the lights in your bedroom and bathroom with dimmer, longer-wavelength lights, consider using blackout shades if streetlights shine into your window, and invest in an eye mask for when it’s time to go to sleep. At a minimum, you’ll wake up feeling more refreshed. Best-case scenario: You’ll live longer. Get plenty of natural light by day: Take a walk outside in the morning. At the office, put your desk near a window. Invest in a bright light — one that delivers 1,000 lux (a measure of light intensity) or more of blue-hued light at eye level — to put on your desk at work. Studies show that most office environments are too dim to stimulate the positive, alerting effects of light by day. One 2014 study by Northwestern University researchers found that people who got most of their bright light exposure before noon were about 1.4 pounds leaner on average than those exposed to most bright light in the evening. Start powering down at dusk: Use programs like f.lux and other apps that automatically shift screens on phones and laptops to more orange-red longer-wavelength lights at night. Several lighting companies, including GE, are also rolling out household bulbs that change wavelengths as the day goes on. Go camping for the weekend: A recent study by University of Colorado-Boulder researchers found that as little as 48 hours spent in the woods, with no artificial light at night and as much as 13 times more natural light by day, prompted campers to shift into nighttime physiology (signaled by a rise in melatonin) 1.4 hours earlier. They also fell asleep earlier than others who didn’t go camping and were less groggy Monday morning. (Reuters Health) — Catching up on lost sleep over weekends may help people keep their weight down, according to a study in South Korea. Not getting enough sleep can disrupt hormones and metabolism and is known to increase the risk of obesity, researchers write in the journal Sleep. “Short sleep, usually causing sleep debt, is common and inevitable in many cases, and is a risk factor for obesity, hypertension, coronary heart disease, as well as mortality,” lead author Dr. Chang-Ho Yun of the Seoul National University Budang Hospital told Reuters Health by email. Sleeping in may be better than napping, as the sleep may be deeper and follows the body’s sleep-wake rhythms more closely, Yun said. To determine how weekend sleep is related to body weight, the researchers used data from a nationwide survey of more than 2,000 people who ranged in age from 19 to 82 years old. In face-to-face interviews, researchers asked participants about their height and weight, weekday and weekend sleep habits, mood and medical conditions. The study team used this information to determine body mass index (BMI), a measure of weight relative to height, and whether participants engaged in catch-up sleep on weekends. Weekend catch-up sleep was defined as sleeping more hours on weekend nights compared to weekday nights. On average, the participants slept 7.3 hours per night and had BMIs of 23, which falls in the healthy range. About 43 percent of people slept longer on weekends by nearly two hours than they did on weekdays. People who slept-in on weekends tended to sleep shorter hours during weekdays, but slept more hours overall across the week. The researchers’ analysis found that those who slept-in on weekends had average BMIs of 22.8 while those who didn’t engage in catch-up sleep averaged 23.1, which was a small but statistically meaningful difference. In addition, the more catch up sleep a person got, the lower their BMI tended to be, with each additional hour linked to a 0.12 decrease in BMI. “Short sleepers tend to eat more meals per day, snack more, engage in more screen time and may be less likely to move due to increased sensations of fatigue when not rested,” said Jean-Philippe Chaput of the University of Ottawa in Canada, who wasn’t involved in the study. Chaput noted that getting 30 minutes of heart-pumping exercise per day can help improve sleep. “Sleep experts say that if people need an alarm clock to wake up it is a sign that they don’t sleep enough,” Chaput said by email. “The more good behaviors we can have every day (and sustain for the rest of our lives) the better it is for the prevention of chronic diseases and optimizing health. Sleep should be one of these priorities,” he said. “Weekend sleep extension could be a quick fix to compensate sleep loss over the week but is not an ultimate solution for chronic sleep loss,” Yun cautioned.